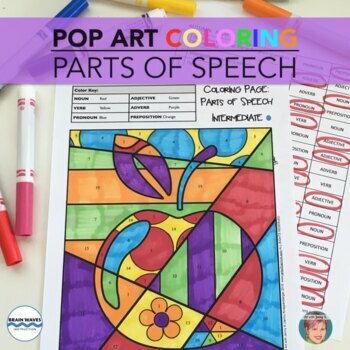 Parts of Speech Pop Art coloring pages make learning and reviewing grammar a lot of fun! 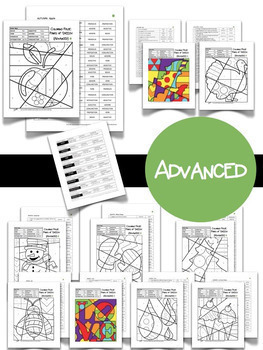 Included are starter, basic, beginner, intermediate and advanced English Language Arts coloring pages to help students (grades 2 to 8) practice parts of speech and review their grammar. This set includes 10 images that are appropriate for different times of the year. With the FIVE levels included you will find that “discreet” differentiation is easy. This parts of speech product is designed to be useful at any time of the year and for the entire year. This resource is HUGE - over 150 pages!!! Art with Jenny K. and Brain Waves Instruction have teamed up to create this parts of speech Pop Art coloring pages resource to help you in your classrooms. These images are selected to go with autumn, winter, spring and summer and some of the major holidays included in those seasons. On the Starter, Basic and Beginner coloring pages you will find that the parts of speech are written directly onto the coloring pages. Students will recognize the part of speech and color it according to the color key at the top of the page. There are 4 parts of speech reviewed on these pages: noun, verb, adjective and adverb. This starter set has the words that need to be colored repeated within a pattern making them the easiest of all the sets to start your students with. 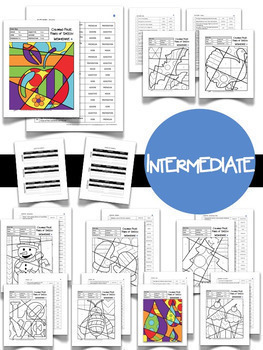 10 Coloring pages as well and answer sheets included. You will need the colors - red, yellow, blue, green, purple and orange in crayons, colored pencils or markers. There are 4 parts of speech reviewed on these pages: noun, verb, adjective and adverb. This set is a step harder then the starter sheets because the words are not repeated within the patterns - creating more opportunity for the students to practice their parts of speech. There are 6 parts of speech reviewed in the beginner sheets: noun, verb, pronoun, adjective, adverb and preposition. There are about 50 words on each page for students to categorize by their part of speech. Students will have 2 pages. The first page has a variety of sentences with a part of speech underlined. The second page is a coloring page that students will color according to their answers on the first page and the color key at the top of the coloring page. For example, if the answer to number 1 is "noun," students would color all the “1’s” on the coloring page red. If the answer for number 2 (on page 1) is “adjective,” students would color all the “2’s” on the coloring page (page 2) green. And so on for all colors and spaces on the coloring page. Parts of speech reviewed:6 parts of speech - noun, verb, pronoun, adjective, adverb and preposition. There are 10 pages of sentences (1 per coloring page) and 16 sentences per page. Also included are answer keys in two formats. For this parts of speech coloring activity students will have 2 pages. The first page will have a variety of sentences with a part of speech underlined. 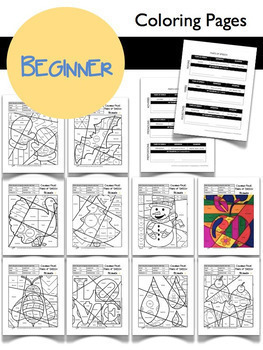 The second page is a coloring page that students will color according to their answers on the first page and the color key at the top of the coloring page. Parts of speech reviewed: 8 parts of speech - noun, verb, pronoun, adjective, adverb, preposition, interjection and conjunction. There are 20 - 26 sentences per page and 10 pages + 10 coloring pages. All answers keys are also provided. You will need the colors - red, yellow, blue, green, purple, orange, light blue and light green in crayons, colored pencils or markers. Also included are instructions and examples and a handout on Pop Art. Please download the preview to see all that is included - over 150 pages!!! Pop Art Coloring Sheets: ELA Parts of Speech FREE SAMPLE. Pop Art Coloring Sheets: ELA Homophone Coloring Sheets FREE SAMPLE.